The holidays are quickly approaching. Now's the time to get ahead of the mad dash, so you can actually enjoy the holidays with your family. See how stay-at-home moms prepare for the holidays, and you'll be ready for the holiday joy and even chaos that the season brings your way. First, you need an at-a-glance plan to kick off the holiday season. It's easy to get overwhelmed with all you have to do during the holidays. Create a calendar of events and tasks to track everything. Print a free calendar to cover the next couple of months. Include your activities, such as parties, family get-togethers, school plays, et cetera, but also make a plan of those other must-do tasks you have to get done. Pick a day you'll wrap presents, decorate the house, visit Santa, select a tree or bake cookies. Your schedule will need to be flexible as new commitments get added over the holidays, but you'll at least have a visual you can easily refer to that will keep you on schedule. As many pennies that stay-at-home moms have pinched to save money all year, the holidays are the easiest time to make all that hard work come to a crashing end. Set a budget now to control your holiday spending before it's too late. Budget for your presents, holiday décor, supplies, food items you'll need at home as well as for socials. You may not know the exact costs of these items right now, but setting a range within your budget will keep you from overspending on the holidays. You don't want your finances to go in the red in December, which will give you the blues in January. You don't have to wait until December to get those cards ready for friends and family. Get a jump on those cards, and save yourself that last-minute panic of having to rush through boxes of cards to make sure everyone on your list gets your holiday greetings on time. Start writing your cards in November, even if you don't mail them right away. Begin with a few cards at a time, and you won't have to sit for hours on end to bang out dozens of cards. Just be sure to keep a few extra cards ready to go for those cards you receive from people who aren't on your list. Make your list, and check it twice. Then set out on a mission to get your shopping done early. Not only will you be able to relax during the holidays, you'll also beat the crowds and can comparison shop for the best deals. Another bonus of getting your shopping out of the way early is that you can track the deals on your big-ticket items over the coming months. That gift you buy now may have been a great deal, or a blowout sale closer to Christmas might be worth your time to take the one you previously purchased back. On the flip side, that item may go up in price or could even go out of stock. Cover your bases now to be a smart shopper this holiday season, and save the most money while making sure everyone in your family gets everything on their list. Ready or not, company is coming. And wouldn't you know it? Some friends and family will be dropping by unannounced, of course. Put your family to work to get your house clean now. While it will be a challenge to keep your house clean over the holiday months, everyone, even the kids, will have less cleaning to do if you all give the house a major overhaul before your days get even more crazy. Wrapping presents can be a lot of fun, especially when you make a party out of it. Have an informal get-together with your friends with a wrapping party. Tell everyone to bring at least 10 presents and three rolls of wrapping paper that each person can use. Make your party even better with some punch and no-bake cookies you can snack on in between present wrapping. Bring on the food this holiday season. From cookie exchanges to pot lucks, your pantry will quickly become bare with all of the cooking you'll be doing. Stock up on your kitchen pantry staples beforehand. Make a list of the food items you know you'll need, such as flour, sugar and baking powder, but also make a list of your party go-to foods and their ingredients, such as pigs in a blanket, fruitcake and gluten-free sugar cookies. That way, you'll have everything you need ready to go for those holiday parties and other social outings. You never know when a child at school or a neighbor will hand over a present. Now you've got to return the kind gesture, which means you'll have to get yourself and the kids in the car, drive to the store, fight the crowds, pick out a present, drive home, wrap it, and then hope some other thoughtful person doesn't decide to give you or your child a gift so you don't have to repeat the process. 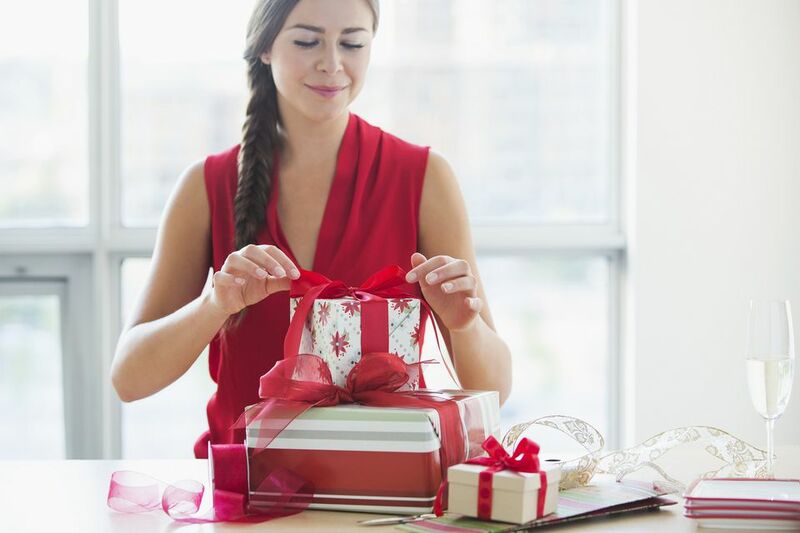 Save yourself the hassle, and be expecting those surprise gifts from good-hearted people. Buy a few inexpensive presents, including children's gifts, while you're doing all of your holiday shopping. That way, you'll be ready for those unexpected gifts. And if you don't give those presents away, you can always take the items back after the holidays are over. You know you're going to need tape, boxes and wrapping paper. Keep those extra supplies on hand. Hit the dollar stores for bags of bows, tissue paper, gift bags and gift tags. You want to avoid that MacGyver moment every one of us has encountered when you run out of tape and actually consider gluing those last few presents just so you don't have to get out of your jammies to find a store that's open. Do you know what often gets lost during the holiday season? You. Sit down and make a list that prioritizes what you want to do and what you need to do. That includes prioritizing your obligations versus what you'd like to do. Don't overextend your family or yourself by feeling you have to attend every single present exchange, cookie swap, Christmas party or holiday play you're invited to. Once you write a list of your priorities, don't be afraid to cross the lower ranking ones off your list. Make sure time with your family simply to enjoy the season is number one on your list. The rest will fall into place.